On the 7th of May 2014, the First Lady of the United States Michelle Obama uploaded a Selfie of herself holding a sign saying “#BringBackOurGilrs” onto her twitter account. The Selfie was part of social media campaign calling for the release of 250 Nigerian school girls taken captive by the Islamist Boko Hraam group. While the Selfie garnered 56,091 re-tweets and 34,892 favorites it also increased media coverage of the fate of the abducted school girls. However, within hours of the publication of Obama’s Selfie, a counter social media campaign began spreading through the internet using the hashtag #BringBackYourDrones, in reference to President Obama’s frequent use of drones in order to kill terror suspects in Afghanistan, Yemen and Pakistan. Interestingly, the State Department’s response to the #BringBackYourDromnes campaign was silence. They did not remove Michelle Obama’s original tweets, nor did they respond to the comparison drawn between the use of drones, which often results in the death of innocent bystanders, and the abduction of school girls in order to sell them into slavery. Yet even more important is the fact that the US has not decreased the use of drones in its war on terror. The digital age has brought with it the ability to listen to foreign populations, understand their opinions on various policies and include such opinions when formulating new foreign policy initiatives. Naturally, no country should base its entire foreign policy on the opinions of foreign populations. Yet as USC scholar Nicholas Cull writes “all actors would do well to identify the points where foreign opinion and its own foreign policy part company, and work hard to close the gap or explain the divergence”. Failure to do so reduces a country’s ability to achieve foreign policy goals and, just as importantly, reduces that country’s credibility. And that is exactly what has happened to the US throughout the Middle East. It’s lack of willingness to engage national populations and explain the gap between local opinion and US foreign policy has eroded its ability to play an instrumental role in one of the world’s most volatile regions. This opinion was best expressed by Alec Ross, former innovation advisor to Secretary of State Hillary Clinton, who in a recent interview was asked if the US can help facilitate democratic transitions in Syria, Yemen and Libya. His response was that the US could do very little as it had very little credibility in the region. Currently, the US is also losing credibility among one of its closest allies-Israel. The framework agreement between the US, the world powers and Iran has led many Israelis to conclude that the US had opted to abandon its commitment to Israel’s existence in order to avoid a costly war with Iran. In an attempt to rally Israeli public opinion in favor of an agreement with Iran, US Secretary of State John Kerry gave a lengthy interview to Israel’s channel 10. Yet such interviews are remnants of 20th century diplomacy. Their impact is minimal. 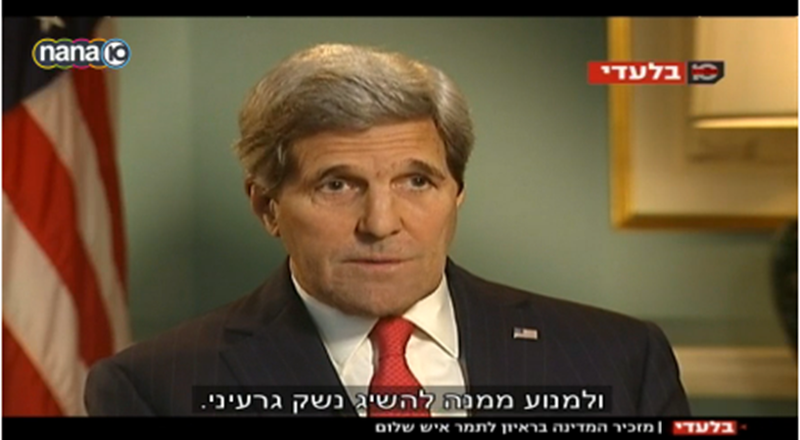 What Kerry should have done is gone online and spoken with Israelis, and not at Israelis. He should have enabled Israelis to express their doubts and concerns with regard to the agreement with Iran while offering relevant answers. Kerry would have faced a hostile crowd and would have been confronted with tough questions yet that is what is required of diplomats in the age of social media. In the 21st century, diplomats can no longer hide in the trenches and settle for the relative comfort of televised interviews comprised of questions that have all been agreed upon prior to filming. The US has failed to explain to Israelis why it supports a deal with Iran just as it has failed to explain to Syrians why Bashar Assad is still able to butcher his people or explain to Egyptians why the US has semi-recognized President Sisi who robbed his people of their democratically elected President. The US State Department has also neglected to explain to the Palestinians living in the occupied territories why it has been unable to promote the cause of Palestinian statehood for more than 20 years or explain to Iraqis why it will settle for limited air strikes while Isis ravages their country. By neglecting to engage with people in the region, and answer difficult questions regarding its Mid-East policies, the US may also be losing its audience. Social media followers look for two way communication. When this is denied, they often leave without returning. This means that digital diplomacy followers may soon abandon the State Department and its embassies on twitter in favor of others, such as ISIS who some reports indicate spends time and effort in conversing with young Muslims all over the world. The US may soon lose the war over hearts, minds and narratives. Of course much can still be done. Internet penetration and social media use is rising throughout the Middle East. A shift in US digital diplomacy towards a conversational, two way model of communication, could enable it to explain its policies and build relationships with foreign populations through the region. In other words, the US can begin to restore its credibility in the Middle East one conversation at a time. Given that in digital diplomacy it isn’t enough to mind the gap, the time has come for US officials, ambassadors and spokespersons to have honest conversations with Israelis, Palestinians, Iraqis, Egyptians and Syrians and narrow the gap between local public opinion and US foreign policy. Some, such as the ones that attacked Michele Obama’s Selfie, argue that actions speak louder than words. I would argue that in the age of social media and digital diplomacy, actions coupled with words speak the loudest. Posted in Uncategorized and tagged #bringbackourgirls, #bringbackyourdrones, Arab Social Media Report, Barack Obama, communication, digital diploamcy, Egypt, Iraq, Israel, Middle East, Syria, Twitter, US, USA. Bookmark the permalink.